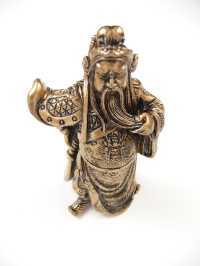 The Chinese name for the God of War is 关公 (GuanGong). It is an immortal of war, and represents justice and protection. It commonly used as a protection symbol, and is worshipped by by all Asians, especially the Chinese. You can display a Guan Gong in a retail shop or office facing the entry for protection.